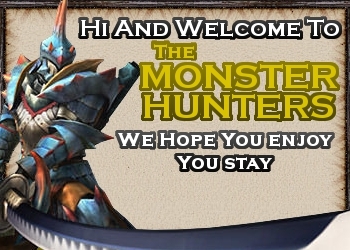 Hi guys, I'm a newbie to this forum but certainly not a newbie to the world of Monster Hunter. I'm a veteran hunter of MHFU and I recently played MHP3rd. I waited for quite some time for the us/eu version of the game but alas it never ventured the shores of the west.. A bit frustrating though but still, there are patches (thanks team maverick one!) that made the game dialogues/menus/etc. comprehensible.. Welcome, play online by any chance? Thanks.. Nope, haven't played online. We don't have xlink kai available here in the country. If we did have, it would be pretty rare and not that popular. We do adhoc sessions here though. Thanks. So how do you find mhp3rd compared to mhfu? Me, I find it better than the latter. Of course there's the language issue and the difficulty issue. I somehow think that mhp3rd is a bit easy compared to mhfu. Not that I'm complaining .. Anyway I'm still trying to finish the elder quests then I'll do the hunter guilds'. Thanks Murtazio! Yeah, I'll be keeping the rules in mind..
Oh! you play on ADHOC? awesome, me too. Yup! That's how majority of the Hunters here do party hunts.. Aw, sorry bro, I'm in ASIA - Philippines particularly. Thanks for welcoming me. So what are you playing now, MHFU or MHP3rd? I'm not sure though.. Maybe not yet. The game was just released last December and its still in Japanese. But I'm curious whether MH3G is better than that on the PSP/PSVITA platform since (for me) PSP has way better graphics/resolution than that of NDS. A belated welcome to the forum. Anyway, yeah how could CAPCOM not follow up MHP3rd with an english version. I mean, it's just like MH2ndG before. It was a hit on PSP that they decided to translate it.. MHF.. MHFU.. Man, they can't expect us to hunt White Fatalis forever.. It's such a disappointment to see MHP3rd not legally translated. Btw, do you think MH3G would be a hit? I heard they had problems with the frame rate on the 3DS.. Thanks blackwater! Be seeing you around the forum..